New watches Rado HyperChrome Automatic Chronograph especially striking his solid and somewhat sombre black 45-millimeter shell, completely made of high-tech ceramics. Ceramics are also covered button chronograph, a crown made of steel and rubber. Solid arrows grim designs complement of rhodium. A chronograph counters and 12 divisions are covered with fluorescent coating, which in the end – a small sports bar, that, in general, unsportsmanlike novelty. The aperture is located at the position of the date of “4:30” hours. Watches are equipped with three-row bracelet of black glossy high-tech ceramics, titanium buckle with a triple and ceramic buttons. 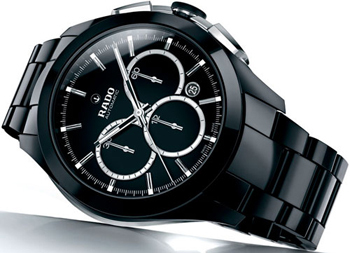 Buy watches Rado HyperChrome Automatic Chronograph can have official representatives of the company.